This is based on a non-scientific sample of 1,572 players of Ingress, Google’s augmented reality game. The survey was posted to Reddit, Google Plus, Twitter, and IRC. From there it passed through informal networks, so hopefully respondents were dispersed enough to make the results meaningful. The game is dominated by liberal Anglophone men. The average Ingress player is 30.5 years old, male (91%), non-religious (64%), and speaks English as their first language (60%). A majority are in the United States and Canada (44%+7%) but there are also sizable contingents in Germany (6%), the UK (5%), and France (5%). Politically there was a definite leaning towards the left, although some fringe identities fared well, including libertarian (13%), green (8%), and anarchist (7%). Long live the eco-techno-utopia! Almost one in three players have skirted around the law: 16% said they had “knowingly broken legal or local regulations in order to play Ingress” and a further 15% ominously said “maybe”. Meanwhile 5% of players said they cheated within the game (using GPS spoofing, multiple accounts etc). For those playing the game, that rate of cheating seems very high, but I think it’s more interesting to see that the game rules elicit far more respect than the law. The game seems to be good for exercise too, 93% of players have done more walking, 24% have gone cycling, and 10% have gone hillwalking/trekking to play the game. 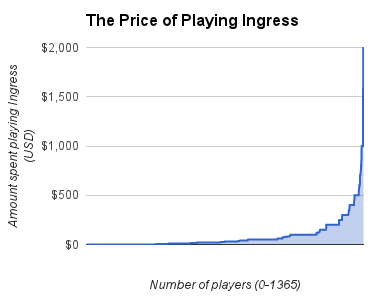 A whopping 74% of players have driven in their car to play Ingress. So while one quarter have gone cycling, three quarters have gone driving. Obviously these groups overlap, but the neatness of the number belies the fact that although the game gets everybody out and about, some get more out and some get more about. I also worry about the 2% of players who have conducted air travel for trips “dedicated to Ingress”! When asked to estimate the total amount of money spent playing the game, the average came to $79.84. This is not surprising considering that on top of all the costs of driving and public transport spent on the game, 16% have bought a new device or hardware to play the game, and 8% have upgraded their phone/data subscription. The breakdown is like that observed on almost any gaming platform. A majority spend nothing or very little on the game, and a core of dedicated players spend exponentially more. In this case, 26.3% have spent $100 or more, and 3.3% have spent $1,000 or more. The two teams are very closely balanced: 786 Enlightened responses, 777 from the Resistance. Half of players chose a team based on the in-game storyline, and the other half deferred to other more practical determining factors. There seems to be a Nash equilibrium of sorts here, which keeps the two teams on an equal footing (in numerical terms anyway). The 23% of people who purposely chose to join the losing team (locally or globally) have a highly balancing effect. The 15% who chose at random would also contribute to equilibrium. Only the 14% who joined the same side as friends have a destabilizing effect. I tried to find characteristic differences between the two teams, I really tried, but there’s a pretty stunning parity. Resistors are a notch older than Enlightened (31.1 vs 30.0 years), but just as male, just as North American, just as non-religious, just as likely to drive and walk and buy a new phone and cheat and break the law. Scoundrels. The only exception is that Resistance does have a more right-of-centre following (ie US Republican) and Enlightenment more left-of-centre (or US Democrat). But both sides are dominated by liberals. If we crudely divided up the political allegiances into left and right, Resistance is 73% left, 27% right. Enlightenment is 78% left, 22% right. Even if the game died tomorrow in a blaze of network failure or patent litigation, Google would still be happy with the traffic it has driven to its social network. Google+ has always suffered because even users who want to use it to share status updates have too many of their friends on Facebook or Twitter. But when talking about Ingress, a perfect storm of profiling drives people back to Google’s social network. Any status update or chit chat is targeted at fellow players, an elite core of early adopting, Android-powered geeks armed with high-end devices and immersed in the Google ecosystem. Now take these numbers with a grain of salt, because this question more than any other was influenced by where the survey circulated. But according to the responses…91% of Ingress players have talked with other players on Google+, 39% have done so on Reddit, 15% on Facebook, 12% on IRC, and 7% on Twitter. 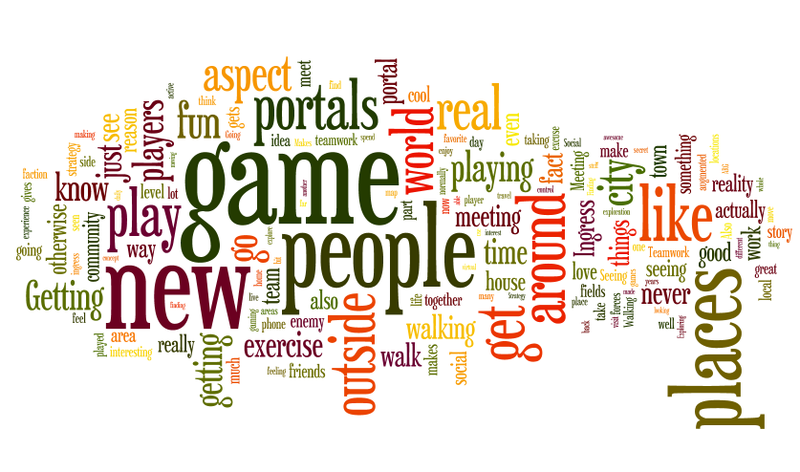 For me the most enjoyable part of reading the results is looking at the self-composed responses at the end of the survey describing people’s favourite aspect of the game. Here are some to give a flavour of the responses. I now have memorized the locations of every post office, library, fire station and piece of art within a 50 km radius of my house. Rather then being a weekend warrior, I’m now a daily commute warrior. The competitive capture-the-flag real world aspect, combined with the digital flavor of Gibson-esque intrigue. I walk a lot more than previously. Walking around looking weird with my device, with a cool reason to do so. The openness. You can’t really hide behind an avatar or nickname because you’ll eventually meet other players irl. It has a very cyberpunk feel to it. Walking/biking around a large metropolis with a tablet in tote, hacking portals…I’m living my favorite 90’s sci-fi books. To play with the dataset yourself you can view it here or download it here. You also can see the original survey here (I’ve left it open). How did you get your activation code? What make is the main mobile device you are using to play? Have you made use of any peripherals? Estimate the radius of your Ingress activity. Which modes of transport have you used on trips dedicated to Ingress. Which platforms have you used to discuss Ingress with other players? When you first signed up, what was the primary influence in choosing whether to join the Resistance or the Enlightenment? Have you since changed sides? Have you knowingly broken legal or local regulations in order to play Ingress? Which of these closest matches your political views? Which of these most closely describe your religious beliefs? Which of the following things have happened because of Ingress? Are your numbers backwards on the gender of players? Your graph shows Male dominance (which is what I expected) whereas the numbers match the Female dominance. A bit confusing. The graphs are a readout pasted directly from Google. I think it may be displaying differently on your screen, seems ok to me. Female is listed first but the number (107) is correct, followed by male (1440). Interesting search but here in France my feelings are resistance are much left “democrats”political influance, more warmhearted and more humanity otherwise enlighted i have met un game in France are like right political influence “republicans”, also sadly selfish and not warm people. That means resistance and enlighted are different kind of people it depends the country… Sorry for my english. Nice try. Republicans prefer the old way, like the Resistance who are resisting change. Democrats are looking for change, for a new way, like the Enlightened, hoping for Shaper evolution. Awesome. The demographics pretty much match my experiences. The only thing that bothers me is the 91% male part. Yup, it’s a bit disappointing but I wonder how that varies from other games. As far as I’m aware, almost all video-type games are overwhelmingly male dominated. FWIW, I play games very rarely but there’s something about Ingress that attracted me to it. I suspect there’s other women out there who might be appealed by the outdoor / explore concept which is what got me hooked. I would have to disagree. Some game types seem pretty equal to me (i.e. Farmville, Say the Same Thing, etc.) In making this reply I did a little research and found an article which claims that men experience stronger feelings of reward in games that involve gaining territory and aggression. ( http://med.stanford.edu/news_releases/2008/february/videobrain.html ) I believe Ingress is highly territory-based, thus causing men to be more likely to join and more likely to continue playing. And most games that I continue to play (beyond a week or two) are territorial. Yup! It’s good to have (subtly) impossible answers in a survey, they’re one indicator of reliability. I have invited several people in the Netherlands to add to the survey as well. Can you report again in some time? Say a month? You can check the results as they come in yourself here, the spreadsheet is live and open. There have been about 100 responses added since I did this report, but I think future results will be influenced by the results so far, making them even more unscientific! I’ve posted the link to the survey in several G+ communities that I belong to, and urged people to add their voices. It’ll be depend on how long the trickle of responders lasts for. There are now 1,758 responses and the data is open to everyone, so feel free to do a follow up. The statistics will be more robust with more people AS LONG AS they haven’t read the results first. SD is alluding to a potential for people to know the results of the survey to be more or less likely to respond based on how much they like the current results. For example, seeing that there are few women responders, women who read the survey results may be more likely to take the survey and share it with their female friends than women who had not read the results. The same could be true of any survey question. Thus, we may expect responses from minority groups (minority in terms of survey questions, not in terms of ethnicity, religion, etc.) to increase, skewing the data. I chose the side I did because I *did not* agree with their rhetoric/image/ideology. I specifically wanted to pick the side I perceived as the “bad guys”. For some reason I thought this would be a common thing to do, was surprised it wasn’t on the list heh. Interesting, I just had a look at some of the answers people typed in as “other” for that question and you’re not alone, but it is a bit of an outlier approach. More common are people who disliked the rhetoric of the opposite team. Also lots of people say there weren’t offered a choice at all, possibly because of a bug, or because the sign up screen at the beginning doesn’t make it clear you can reject the initial suggestion. So maybe Google is actually relying on this kind of nudge technique to keep the teams balanced. Can someone send an invite my way? Been trying but I am not so good at photoshop so impressing the 4 is just about impossible. You forgot to ask how many of them are stoners. I’m sure you’ll find that most of them spend their days smoking weed. Good point, drink/drug/cigarette use might have been interesting. I’ll add it to the pretty long list of things that should have been in the survey! I really enjoyed reading this, too bad I haven’t participated. Please do a survey again after some time, it might be interesting to see if certain things change over time (or not). Glad you liked it, if we’re all still playing Ingress this time next year I will certainly do a follow up! Agreed! We should see some change in demographics from the early adopters to the majority users. Web page comment: Could you ensure some space between the numbers and the percentages? They run together. Thanks for the heads up. I gather the formatting is a bit squashed in some browsers, will cross-check for future posts. Hey chalk up 1 Korean -Mother tongue. Level 8 in Toronto, Canada. Cheers. Personally I don’t planning on doing anything else with the stats but they’re openly available on the web so others might. Social, location-based, mmorg? Count me in! Especially if my cohort are left-wingers and atheists. what we conclude from here from this game is people are more human online or on the internet than the most of the we see on other meduim..which represent hedonist views ..
and the most astonishing thing for me was The 23% of people who purposely chose to join the losing team ….Wow….this represents the same way why most of the open source projects survive ..and people donate . Have you found a difference between rural/city players? Here in germany it seems that people in big cities (students ?) tend to play resistence (they see a policeman “oppressing” them every day). In rural areas (want new technology like working internet, official “forces” take one hour to arrive when you call them) enlighted is preferred. It would be interesting to see this same survey done now, a half year later. When this survey was originally done it was at the infancy of Ingress. Is anyone else still waiting for the paascode they promised us in order to collaborate with the survey? Just realized this was out of the first survey! Was hoping to see breakdown of player ages. I’m 70 yrs old. Just wondered how many other retirees are playing. Seems like there are 6k responses now. Maybe update the graphs?